lalaforfashion: Notes on Phoebe Philo: or reworking the Classics at Celine Fall/Winter RTW! 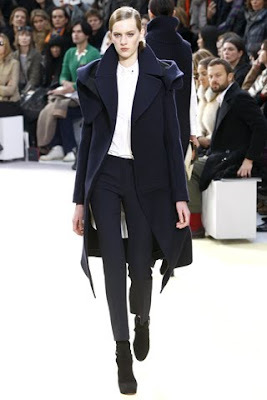 Notes on Phoebe Philo: or reworking the Classics at Celine Fall/Winter RTW! Like a seasoned marathon runner, Phoebe built the momentum in the Celine Spring/Summer & Resort collections and won the race during her Fall/ Winter show! I would wear 90% of her collection! Phoebe knows her customer and she is a genius in creating demand for old classics with a twist! Like this simple LBD with leather pockets, or a classic coat with uber cool shoulders! Celine's collection is just spot on - chic, timeless and oh sooooo beautiful!